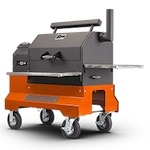 Would I have any issues smoking (4) 12 pound briskets on this smoker? Does is cause any temp. issues? I have had 12 large pork butts on my 640. I have never done multiple briskets, but I don't think you would have a problem getting 4 on the cooker. As always, when you fill any cooker up, you may want to consider rotating the meat to even out the cooking. 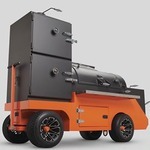 Yoder_Herb wrote: I have had 12 large pork butts on my 640. I have never done multiple briskets, but I don't think you would have a problem getting 4 on the cooker. As always, when you fill any cooker up, you may want to consider rotating the meat to even out the cooking. Herb, how much longer did that take when it was fully loaded? I did three briskets this weekend. Two 14lbs on the bottom and one 12 on the top. The cook time was no different than if I did one brisket. I rotated the bottom briskets one time. The 12lbs brisket was done earlier, but not by much. Remember, the top rack runs cooler so I would suggest putting your smaller briskets up top if you cook multiple. I could have done 4 14lbs in the cooker if I wanted too. I'm loading it up with 10 butts tonight...or whatever I can fit.